Nikola Tesla was one of the greatest scientific minds who ever lived. His genius matched and in many cases exceeded that of Einstein. Whereas Einstein's work was primarily in theories and equations describing the universe, Tesla was an inventor. Tesla developed working models with most of his ideas. He actually demonstrated his theories and inventions, most of which were so astounding they could hardly be comprehended during his lifetime. * Rotating magnetic field principle. The induction motor alone is responsible for virtually every electric motor you have ever encountered: vacuum cleaners, hair dryers, washers, refrigerators, fans, and on and on. You have probably never heard of the Tesla coil, but it is widely used in radio and television sets. 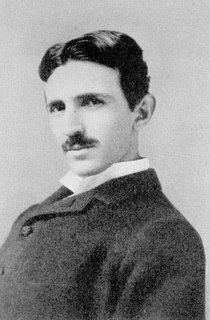 Nikola Tesla was born in 1856 in what is now known as Croatia. He emigrated to the United States in 1884. He first worked for Thomas Edison. Edison gave Tesla a challenge and promised Tesla a handsome reward if he completed the seemingly impossible task. After working nonstop for two days Tesla produced what Edison had asked. Edison reneged on the deal, telling Tesla, "I was only kidding." * Developed shadowgraphs, which were later used by Roentgen in his discovery of X-rays. * Tesla created man-made lighting in the 1800s. * Tesla lit two hundred electric lamps 25 miles away without wires! * Tesla installed the first power-generating machinery at Niagra Falls, bringing electric power to Buffalo, New York in 1896. * Tesla discovered terrestrial stationary waves, proving the earth could be used as a conductor for electrical vibrations. Much of Tesla's work is in the hands of the U.S. military, and only some of it is just now being understood in its entirety. Expert sources say his inventions and discoveries are being used successfully today in advanced weaponry, including particle-beam weapons, active space travel (far beyond the capabilities of NASA's space shuttle) time travel, time-warping, antigravity devices, and through-the-earth communications. The entire earth is permeated and surrounded by active electrical and magnetic energy of untold power. (Ever see a lightning storm?) Tesla's inventions can pull this energy from the atmosphere and then store it and use it to drive a propulsion system at virtually no cost. Such a system is said to be used by the military to power aircraft and spacecraft at beyond supersonic speeds. When Tesla died on January 7, 1943 in New York City, the FBI made an immediate trip to his apartment to gather all his notes. These notes have never been released. Even today, the FBI maintains an extensive file on Tesla's discoveries. To this very day a request for information on Tesla's files through the Freedom of Information Act will result in receiving numerous pages with blacked-out passages. The amazing thing is that most people have never heard of Nikola Tesla. If you are a teacher or a student, immediately check our list of Tesla material in the Bibliography. If you are teaching or studying science, knowledge about Tesla will revolutionize your life's work and your thinking. In his day, Nikola Tesla was an international celebrity. Along with his other accomplishments, Tesla lit the Chicago World's Fair in 1893. He was considered so important that international press conferences were held each year on his birthday. The whole world wanted to know what he was going to do next. GOD SAID, "LET TESLA BE," AND ALL WAS LIGHT.